Model 537 Extra heavy construction provides long life. Top guided disc assembly incorporates resilient seal in seating area. 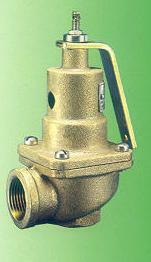 Working parts are protected from corrosion by discharged liquid by an isolating diaphragm. Pivot between disc assembly and stem corrects for misalignment and compensates for spring side thrust. Heavy duty lift lever.